This German cottage quartz cuckoo clock accurately keeps time and plays 12 different melodies. 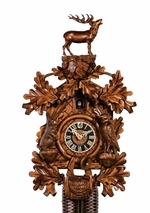 This clock features a deer, water pump, and tree on the base. Two decorative pine cone weights are suspended beneath the clock case by two chains. The pendulum swings back and forth.